Have you ever wondered what is the difference between pilot watches or standard watches for men? 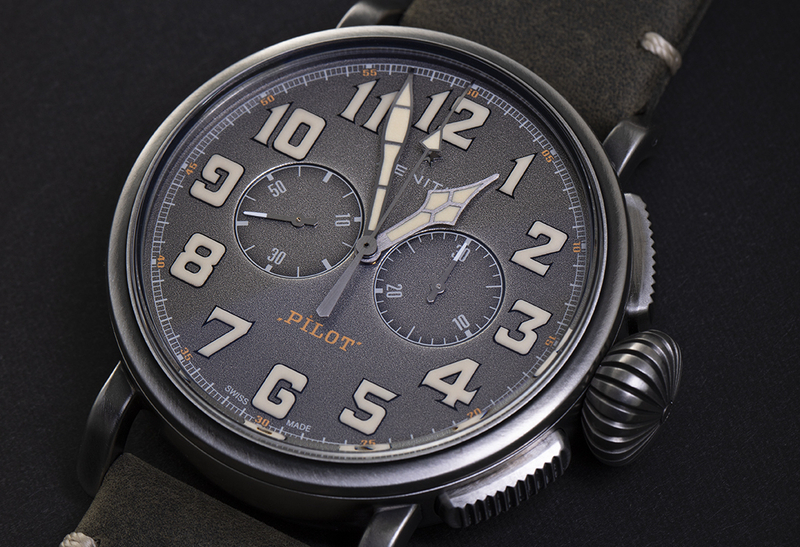 Originally pilot watches were adopted in World War II and designed specifically for pilots. Key differences were a larger dial with a simple design enabling owners to quickly glance and know what the time is, a larger wrist band as pilots wore their watches over their pilots’ jackets and a larger crown so that it could be used while wearing gloves. There were additional features on the pilot watches such as a chronograph, navigation tools so pilots had a better chance of returning home safely with the ability to check fuel and speed. Nowadays pilot watches are not just for men and for women too, whether as pilots or as travel watches. There is not the need for such self-reliance in a cockpit due to technological advances, so designs can be more minimalistic and still retain that original aesthetic appeal of the best pilot watches all those years ago. Manufacturers have enhanced their designs of pilot watches with some magnificent specimens available on the market that not only function superbly, have impeccable detail and these aviator watches are a good investment. In true style of Rolex Sky Dweller, a relatively new addition to their range, is sophistication personified. It has all back up the Rolex design and style and is arguably the most prestigious of mens pilot watches available today. Customers are spoilt for choice in their preferred aviator watch design with 24 different permutations possible in terms of material, type of bracelet and the colour of the dial. The Sky Dweller has a beautifully set 24-hour disc, which is just slightly off centre and can be used to know what time it is in another zone, be that at home, at work or with a valuable client. At 3 o’ clock this watch shows the date and the rest of the design is unmistakably Rolex. Sheer class that most other watch makers aspire too and has grown a loyal customer base and reputation for all of the ranges that Rolex has had to offer. It is not all about Rolex. There are other watch makers who are worthy of respect because of the amazing technology and design feature that they have applied to the pilots’ watches. IWC pilot watches are by no means the exception although this fine watchmaker is undoubtedly excellent in making outstanding watches that provide precision timing and spectacular designs. IWC pilot’s watches provide additional functions to suit the needs of the owner, all have the chronograph function as standard showing hours, minutes and seconds, day and date display with special design features such as a sapphire glass that has anti-reflecting properties on both sides just for good measure and is protected to withstand drops in air pressure. If ever a watch maker has captured the essence of what pilots’ watches are about then it is Zenith. This splendid Swiss watch maker pays homage to the aeronautical past of bygone years and encapsulated all that with its iconic design and colours. Cleverly Zenith has utilized colours such as blends of khaki, greens and browns with fabulous results, even down to the details of the shape and colours of crowns, with splashes of steel thrown in for good measure. Obviously, this Zenith Pilot watch is not just available in a specific colour range, and time keeping, the Zenith Pilot watches range offer a simple dial and are easy to read but also provide intricate details in the shape of the elegant hand and the numbering that has retro-features. Undoubtedly a Zenith watch that will be happily worn by any owner. The Hamilton Khaki Aviation watch is available in other colours than khaki, and in actual fact is mostly available in other colours. Hamilton are very good at providing luxury watches for men that intelligently combine simplicity with extravagance which is typically seen with the Khaki Aviation watches. A good example is how the hands site over the chronograph: the minute hand has a cut out feature inside the chronograph and solid features outside of the chronograph, the hour hand features are opposite to the minute hand. The preciseness of these details in a subtle and yet so effective. The casing of this Hamilton pilot watch is shaped such that it blends in the crown very stylishly. Their advertising references American Aviation which is slightly irritating because there are many countries that can claim high standards in field. There are so many words that can describe this wonderful G Shock watch such as: strong, robust, precision, design details, shock resistant, fully functioning. Casio have put every ounce of their expertise into the G Shock pilots watch. The ‘G’ stands for Gravitymaster, Casio’s range of watches that are shock resistant. It has the Casio computer technology providing precision timekeeping, an unmistakably rugged masculine design, although that does not mean specifically watches for men. As far as technology goes, the Casio G Shock has set the standards, it has Bluetooth, receives radio waves and GPS, can be paired with a smartphone and updates to any time zone the owner wants.